Term 1: 7/9/2018 7:00 a.m. – 1:45 p.m. Term 2: 9/25/2018 7:00 a.m. – 1:45 p.m. Term 3: 12/11/2018 7:00 a.m. – 1:45 p.m.
Standard High School or State Awarded High School Diploma is required prior to entry. The Practical Nursing program prepares a person to participate in the planning, implementation, and evaluation of nursing care in hospitals and extended care facilities. Students are introduced to the clinical area early in the program. Theory and clinical procedures are integrated to reinforce learning. A certificate is issued at the successful completion of the program in accordance with state guidelines. Graduates are eligible to take the NCLEX-PN licensure examination. The Florida State Board of Nursing will issue a license to those who pass the examination. The Florida State Board of Nursing will issue a license to those who pass the examination. 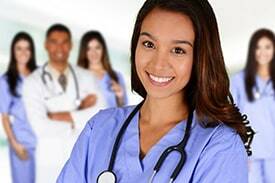 Successful completion of the Practical Nursing course may be used toward an AS or BS Degree. Upon completion of the program and meeting eligibility requirements, including the attainment of an aligned industry credential, students may be awarded credits toward an Associates Degree by Broward College or the Florida College System. Students must enroll in Broward College within 2 years of completing the program at Atlantic Technical college. Additional college credit may be awarded with the attainment of additional industry credentials. IMPORTANT NOTE REGARDING REGISTRATION: COMPLETION OF THE REQUIREMENTS FOR ENTRY INTO THE PRACTICAL NURSING PROGRAM MAY TAKE A MINIMUM OF THREE WEEKS. PLEASE ALLOW SUFFICIENT TIME PRIOR TO THE REGISTRATION PERIOD TO COMPLETE ALL ENTRY REQUIREMENTS. Must have at minimum, a standard high school diploma, state awarded high school diploma, or high school equivalency. College degrees must be from an accredited college or university. Achieve minimum levels on the TEAS/HESI (Test of Essential Academic Skills) PRIOR TO REGISTRATION. Attend a PN specific orientation for additional details for entry into the program. Students enrolling in any Health Science Education program must undergo a Level II criminal background check and drug screening, per The Joint Commission. Students who do not have a valid social security number may encounter difficulty with certain state licensing agencies and registries. Contact the program counselor for specific information. Students with questions or concerns should contact Dana Allen, the Practical Nursing Counselor by e-mail at Dana.Allen@browardschools.com or by phone at 754.322.2818. For more information about the Practical Nursing/LPN Training program, sign up today for a program orientation today! ACEN – Accreditation Commission for Education in Nursing, Inc.